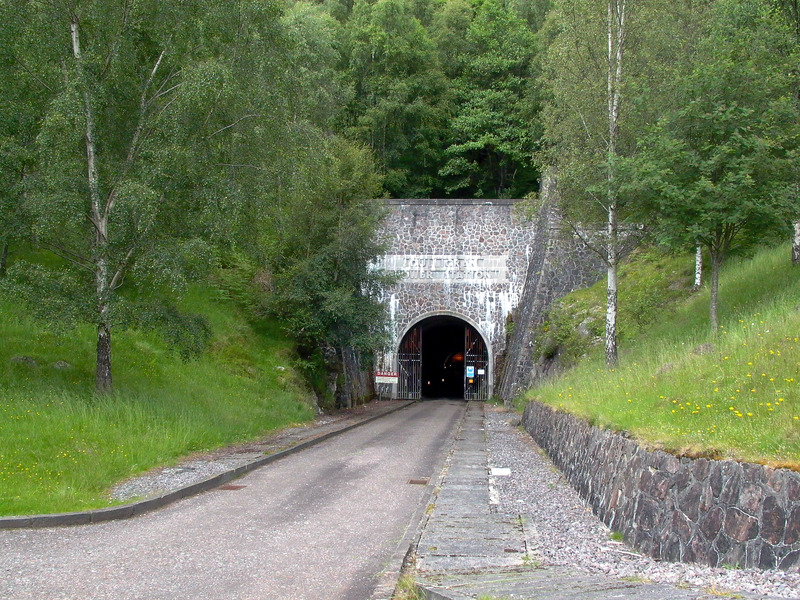 The Strathfarrar scheme was one of the last constructed by the Hydro (started 1958, finished 1963), and it shows. A lot of advanced (for the time) and experimental thinking went into this scheme. The power stations are undergound, tunneling and construction techniques has reached an advanced stage, having been honed on earlier schemes, Britains largest arch dam was constructed for the main reservoir, and Culligran got Britains first (only?) Deriaz turbine installation. The whole scheme was designed from the outset to be entirely remote-controlled, with no permanent station staff. Culligran is a medium-head (180ft) development of the 'traditional' kind (dam, low-pressure tunnel, surge shaft, high-pressure shaft/tunnel, power station, short tailrace). Storage is provided at Loch Beannachran, which has been enlarged (but not raised) by the fairly modest structure of Beannachran Dam, situated in a gorge downstream of the original outlet of the loch. Loch Beannachran receives the discharge from Deanie power station, which is in turn supplied from the main storage reservoir of the scheme at Loch Monar. Water is taken from an intake structure adjacent to Beannachran dam into the main Culligran tunnel, 17,000ft long, to the surge chamber, which is of the differential type, with seperate main and riser shafts. From there the water falls down a vertical high-pressure shaft, from the base of the shaft a short length of high-pressure tunnel leads to Culligran power station, which is constructed underground. After passing through the turbines at Culligran, a short tailrace tunnel discharges the water into the river Farrar. The water from Beannachran is supplemented by one side-stream intake, on the Neaty Burn. A second side-stream intake was proposed to take additional water into the surge shaft, andis in fact drawn on the plans for the scheme, but it was never constructed. There are 50 images of Culligran in the Records, and 11 webpages. They may all be accessed via the general arrangement drawing at the bottom of this page, which is a clickable image map. Each area selected will open in a new window. Drilldown to high-resolution imagery IS available online for this site. NEW Nov. 2005: On the occasion of my last visit to Culligran, the station was being extensively refurbished. Some photographs of normally-inaccessible areas were taken and can be seen on my Culligran Refurbishment page. The rest of the Culligran pages have been extensively updated with new & improved imagery. Words and images © 2002 Michael J. Ross.